The Goldfinch is a painting by Carel Fabritius (1622-1654). He was Dutch, a pupil of Rembrandt and the teacher of Vermeer: one of the most important and influential links in the art world. Have you heard of him? Neither had I, until last month, because the majority of his work was destroyed in the explosion that killed him in 1654, when he was just 32. The Goldfinch is one of the very few paintings to survive. Theo Decker is thirteen when a bomb planted in the Metropolitan Museum of Art changes his life forever. After his unreliable father left him and his mother, they were two against the world; she was his light, his anchor, and his best friend. When tragedy snatches her from him, Theo is left alone and directionless in New York, bewildered and heartbroken as he is passed back and forward between social workers and eventually taken in by a rich friend's family. Heartsick with loneliness for his mother, he clings to his last memory of her: the painting they saw together, Fabritius' The Goldfinch. Throughout years, journeys and personal darknesses, it is a symbol of beauty and lost things. The Goldfinch is my new favourite book. It was Ruby from Rustled Pages who recommended it to me. We have very similar taste in books and I trust her implicitly, so I bought the book and then, as is my wont, let it sit unread for a few months. 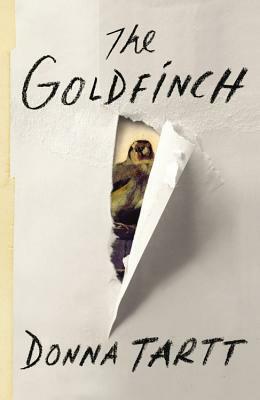 Normally I'm the type to leave books for a few years -- really, there are some unread ones I own that fall into that category -- but for some reason I felt drawn to The Goldfinch, and decided to give it a go. Utterly beautiful, captivating, and one of the best things I've read this year. I love art, and I was fascinated by the way it centres around the painting; I'd never heard of Fabritius, and to learn a little bit about him was marvellous. 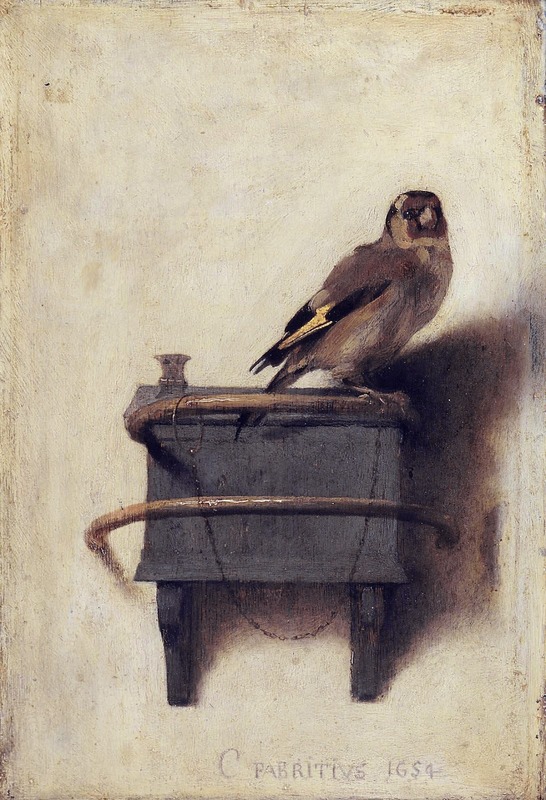 I think it's so clever as a premise: to take that explosion in Delft, Holland in 1654 -- the year The Goldfinch was painted -- and to reimagine it as a terrorist attack on the Met Gallery. Tartt clearly shows the enduring power of art: the fact that a painting could survive such a thing twice, and retain its importance. "Even when I couldn't see it I liked knowing it was there for the depth and solidity it gave things, the reinforcement to infrastructure, an invisible, bedrock rightness that reassured me just as it was reassuring to know that far away, whales swam untroubled in Baltic waters and monks in arcane time zones chanted ceaselessly for the salvation of the world. ... "Time warp: a way of seeing things twice, or more than twice. Just as my dad's rituals, his betting systems, all his oracles and magic were predicated on a field awareness of unseen patterns, so too was the explosion in Delft part of a complex of events that ricocheted into the present. The multiple outcomes could make you dizzy. Steadily the goldfinch watched me with shiny, changeless eyes." In years to come, I guess that what I'll remember most about The Goldfinch is its utterly captivating quality. It's a long book, and so much of it is reflective or introspective; so much of it is an ordinary person's ordinary life. But it was still wholly encompassing. "Unputdownable" is an ugly, constructed word that should never be applied to something as beautiful as The Goldfinch, but that's what it was. "For the deepest, most unshakeable part of myself reason was useless. She was the missing kingdom, the unbruised part of myself I'd lost with my mother. Everything about her was a snowstorm of fascination, from the antique valentines and embroidered Chinese coats she collected to her tiny scented bottles from Neal's Yard Remedies; there had always been something bright and magical about her unknown faraway life. ... She was the golden thread running through everything, a lens that magnified beauty so that the whole world stood transfigured in relation to her, and her alone." So it goes on for several pages (and if I could in any way justify typing out the entire thing, I would). On every page of the novel a fresh feeling or emotion jumped, another thought that I myself have had, a sensation that I've felt; again and again I had to sit back, look up for a minute, wrapped in waves of awe that Tartt had so magically captured my inarticulated feelings. It is a marvel of writing, and I could not be more sincere in saying that. "Sometimes, unexpectedly, grief pounded over me in waves that left me gasping; and when the waves washed back, I found myself looking out over a brackish wreck which was illumined in a light so lucid, so heartsick and empty, that I could hardly remember that the world had ever been anything but dead." Theo has issues -- serious issues -- but the wonderful thing about The Goldfinch was that it didn't feel like an "issue book". So often authors dealing with serious problems -- alcoholism, drug addiction, depression, any sort of mental illness -- manage to turn their book into a horrible manual. "This is [main character]," they say, "and he/she struggles with [insert condition here]." Then they proceed with a novel wherein the MC is wholly defined by said struggle; there is nothing outside it. The Goldfinch was the opposite. Tartt somehow managed an amazing balance between Theo's tragedy and his pragmatism as a likeable narrator. Again, I can say truthfully I was in awe. What of the other characters? They were all so developed and complex: Boris, the unreliable but attractive Russian friend; Theo's father; Pippa; Kitsey; Hobie. Each was distinctive, and each I'll remember for a long time. "Hobie lived and wafted like some great sea mammal in his own mild atmosphere, the dark brown of tea stains and tobacco, where every clock in the house said something different and time didn't actually correspond to the standard measure but instead meandered along at its own sedate tick-tock, obejying the pace of his antique-crowed backwater, far from the factory-built, epoxy-glued version of the world." On one level, The Goldfinch was a love song to a lost world: an old world of antiques and art and simpler times. The character of Hobie represents this. But in another way, we see through Theo that the world has an enduring nature: a brutal coldness that makes it very easy to be lost, to scream and have no one hear you. What more can I say about a perfect book? Only that it wasn't perfect; it was dark and unsettling, heartbreaking in fact, and the worldview that permeated it was one of hopelessness. It left me raw and full of questions, but I'd be wrong to say there was no uplifting note. Theo managed to convey the commonality of humanity; a sense of togetherness, perhaps, or some sort of hope that ties of love will continue. "The point is maybe that the point is too big to see or work round to on our own." "Just as music is the space between notes, just as the stars are beautiful because of the space between them, just as the sun strikes raindrops at a certain angle and throws a prism of colour across the sky -- so the space where I exist, and want to keep existing, and to be quite frank I hope I die in, is exactly this middle distance: where despair struck pure otherness and created something sublime." It is long, not hard to get through, though; I was so hooked right from the start and I couldn't get enough of it! It would be nice on audio, though. FIND IT, READ IT, LOVE IT! That is such a pretty bird! The book sounds very good as well. I'll have to go investigate. It might be one of the books I have where I just shelf it and forget it, but I definitely need to get around to it. I knooow! I love the painting so much. It's glorious. The book is WONDERFUL. I didn't shelf it for *too* long -- only a few months -- but I know that it is difficult to get round to everything! Ooooohhh..... The art is prrreeety. Also really cool that this is what the book is inspire/based around. Will definetely add this to the reading list asap. It certainly sounds like a very worthwhile read - and I trust your book recommendations! I knooow, it's inspired to me to right my own based-on-a-painting novel! I want to write about art, it's all I want. Okay, I want to cry now. This books sounds so beautiful and so soul-touching. The words. I love words. But really that whole last bit you wrote just gets me. Everything antique and nostalgic. Everything lost and unfound, whether it's been lost to another time or lost in the rush of people and not noticed amongst them all. And then the fact that individually everyone is lost in the rush and somehow that connects and makes us all one. All of that. Those are the things that always hit me hard. I don't even know why. If I find it, I'll have to read this book. OK, you expressed beautifully what I was trying to express. I absolutely love the sense of age in the book. I know I quoted it once, but I'm quoting it again: "time didn't actually correspond to the standard measure but instead meandered along at its own sedate tick-tock, obejying the pace of his antique-crowed backwater, far from the factory-built, epoxy-glued version of the world." The whole idea of The Goldfinch is of a painting that's lasted five centuries, through two explosions, and has touched lives throughout all that time; a thread that unites humanity from one year to the next. That's the incredible thing about art -- paintings, but also books and music -- that it can speak to one generation and then another. When I read and love Pride and Prejudice, I can imagine other teenage girls in every decade for two hundred years reading it and loving it and falling for Mr Darcey. And isn't that quite something? Of course, that kind of thing isn't ultimately going to be a substitute for faith in the living God -- and despite its uplifting note, The Goldfinch was still in the end lying in the sphere of life without Jesus -- but it was still incredibly powerful. I couldn't recommend it highly enough.